Mt Eden community bookshop, Time Out Bookstore, has been named Bookseller of the Year at the NZ Book Trade Industry Awards for 2016. Allen & Unwin Publishers have been named Publisher of the Year. Another Auckland independent bookshop, The Women’s Bookshop in Ponsonby, has walked away with the bookseller’s Marketing Strategy of the Year for their fantastic NZ Bookshop Day event. This saw a whole range of their celebrity customers in a moving window display, which led to impressive sales on the day and a very successful campaign overall. Sales Reps are the essential connection between bookseller and publisher, bringing the publisher’s best books to their essential audience. Winner Louise Crisp, from Penguin Random House NZ is described as “having aplomb, commitment, engagement, helpfulness, a sense of humour and as being gentle, friendly, honest, and conscientious,” says ex-publisher, judge Tony Harkins. Publisher of the Year goes to Allen & Unwin, for their dedication to New Zealand publishing in a difficult time. “These publishers have plans and vision for the future. They are sound. And they continue to diversify…they are producing very fine books,” says Helen Parsons. Wellington-based Bridget Williams Books wins the NZ Book Industry Special Award for their consistent publication of “splendid books which beautifully represent New Zealand culture. “Bridget Williams Books tirelessly represent our stories, our people and our place, and strive to find new ways to tell these stories,” says Ferguson. The Lifetime Achievement Award is deservedly awarded to Paul Greenberg from Greene Phoenix Marketing, for his tireless championing, through ill health and well, of his publishers’ books. Greenberg has spent his life representing books for sale to bookshops all over New Zealand – the only sales rep to do so. Also announced during conference were the Kobo Scholarship recipients for 2016, who were named as Courtney Smith and Rochelle Handley. Booksellers NZ is grateful for the sponsorship of Kobo, which allows these young booksellers to attend the Winter Institute in the USA, which next year will be held in Minneapolis in late January. Our book industry is thriving. We may be small in size, but we are great in ambition, and the strength of our publishing and bookselling industry proves this year after year. Sponsors of the NZ Book Trade Industry Awards are Book Tokens Ltd and Nielsen Book. 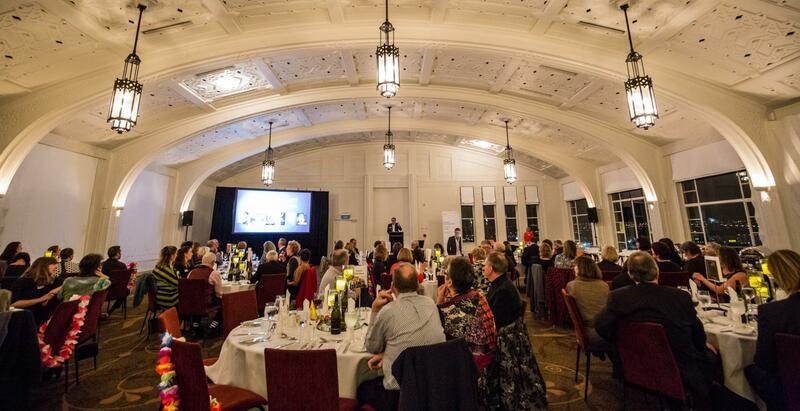 The Book Trade Industry Awards are held as part of Booksellers NZ’s 95th conference, at Heritage Hotel, Auckland. Image: Time Out Bookstore, high res image available on request.